Update September 2011; If you're looking for a kit of modern parts that's quite sensitive and easy to build I recommend the Useful Components Choccy Block Crystal Set Radio Kit. I've discussed elsewhere my experiences recreating the full version of the G.C. Dobbs Ladybird Book "Making a Transistor Radio," Radio. But the first thing in the book was a crystal set design, to ease the young radio constructor into things gradually. This was what I tried to make first as a kid, and had zero success with it for months if not years, before figuring out one or two things by trial and error. But first let's fast-forward to the present to see one way to make a quite good crystal set radio. I've tinkered with this over the years, and always had quite poor results due to various things, but the main one has always been a lack of space and location in which to erect a proper long wire aerial. Well, while walking back from lunch from one of my works buildings to another, I chanced to look skyward and noted the four-storey nature of these buildings and the adjacent multi-storey car parks. Tall buildings, with easy access to a rooftop balcony on one, and the top floor of the car park on the other, about 80 metres apart, on a private site? Hmmm. You can see where this is leading. So I decided that slinging up a nice wire aerial over the quiet Christmas season shouldn't attract too much attention and would be a good proving ground for a decent crystal set. But first, we need a design for this decent crystal set. There's no shortage of designs on the web. Double tuned designs, designs with exotic spider web coils, double-diode detectors, voltage doubler detectors, low impedance headphones with audio transformers; The choice is endless. So what I'm going to present here is yet another design that is nothing special but which I quite like. I particularly like it because it is possible to optimise it for loudness in the particular conditions and components that you find yourself with. Once you find the optimum points, you then know that it's as good as it's going to get, and you can stop fiddling with it and go and do something more useful. 1 long ferrite rod from an old transistor radio, about 7 or more inches long if you can get it. This consists of three coils fitted onto the ferrite rod in such a way that they can slide up and down on it. Coils from an old radio should already be able to do this if you scrape off the sealing wax. The main MW tuning coil is put in the middle of the rod and the tuning capacitor is connected directly to it. Considering the lengths that people go to when winding these coils in order to keep their main tuning tank free of unwanted losses, it's sensible to keep this wiring as short as possible. I have to digress here. As suggested above, you can buy really exotic coils made out of super Litz wire which exhibit Q factors of 750 in a 300uH coil at 1MHz, or you could make one out of gold plated 2 inch diameter copper tubing or some such. But there's a limit to how much Q you could ever actually want in a crystal radio coil, and it's worth going into this in some detail to see how far we might want to go down the coil-winding craziness route. High Q in an LC tank gives sharper tuning, which we want to some extent. When we start taking energy out of the tuning tank in order to actually listen to it, whatever Q you started with will drop and inevitably the tuning gets broader. So what Q do we actually want in the finished radio? Taking the tuning tank on its own for the moment, lets assume a typical MW coil of 370uH tuning into 1MHz using a 68pF capacitor. The RF bandwidth of an AM radio station in Europe is about 12KHz, so you would never want to go any narrower than that or you would start to filter out the treble content which provides some of the loudness. 12kHz bandwidth at 1MHz equates to a Q of 83 and that would be equivalent to a perfect LC tank with a 195kOhm resistor in parallel. Now the aerial coupling coil and output coupling coil will load the system, reducing the Q. When the three coils are coupled optimally, this boils down to having three equal resistances in parallel which are the lossy parts of each circuit, aerial, tuning tank and output. It's these three resistances in parallel that in the complete system should never be more than 195kOhms. So, each of those resistances should never be higher than 195k X 3 which is 585 kOhms. So if the perfect tuning tank had this made-up 585K Ohms across it, what is the Q? The answer is 2.pi.Fo.C = 254. I still haven't answered the question of how far into coil-winding craziness we need to go to get a decent loud crystal set coil. So I measured the Q values of LC tanks that you can make with some reasonably available parts. The ferrite rod has some losses in it of course, as all magnetic cores do. But this is partly made up for by the fact that you need much less wire in the coil to get the same inductance. Less wire => less resistance loss. All these were measured by making a tank circuit using short connections to an airspaced radio capacitor at about 1MHz using a 10 MOhm scope probe. I induced a signal using very slight inductive coupling from a signal generator and varied the frequency either side of the peak until the voltage was 1/root2 times the maximum. The difference between those two frequencies I took as the -3dB bandwidth, and yes, the results are approximate. It's not easy to do it this way as the Q values get higher. The error in the frequency and voltage measurements gets wider even with a good digital scope with measurement averaging, as the physical stray fields and capacitances drift around with positioning of the human involved. Measuring higher than Q = 200 is going to be difficult in any circumstances without some special equipment. So, having a Q of 173, the conclusion of this so far is that the 1960s transistor radio ferrite rod and coil are getting pretty close to the point where you wouldn't want to go any further, and the fact that we had some small input coupling loading and a 10M 'scope probe in the system is working in our favour in that the real Q must have been slightly higher than what I measured. The double pile of standard 7 X 0.2 PVC covered hookup wire is still quite good for the tuning tank. This suggests that using lesser coils for aerial and output coils is definitely a go-er. On the left of the tuning coil is the aerial coupling coil. One end of this connects to your ground connection and the other end connects to your aerial. The aerial coupling coil will typically have something like ten to twenty turns on it. Another slight digression worth mentioning here is that you can sometimes get a static charge building up on a long wire aerial in certain circumstances. Coupling into your system with this D.C. connection to earth avoids this build up. On the right is the output coupling coil and in my trial I used another MW radio tuning coil. I will experiment with something that doesn't need to be bought at a future date. This is connected via the usual germanium diode to a 10nF capacitor and the headphones. The capacitor serves to remove the residual RF from the rectified audio signal and makes it easier to measure the audio on an oscilloscope. In my set it made no difference to the loudness but I would recommend to include it as it stops radiofrequency energy going up the earphone circuit. This helps make the tuning less sensitive to where you are sitting or how you are moving about. Both earpieces of my headphones were connected in series and measured 90 Ohms DC on each earpiece making 180 Ohms d.c. total. But they were quite inductive and at 1kHz measured about 1.5KOhms total. 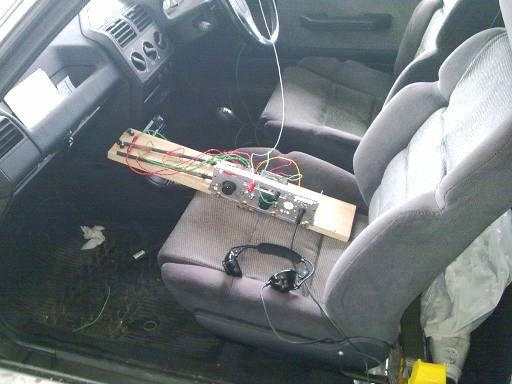 Assuming you've built the radio as shown and connected up a reasonable aerial and an earth connection like a central heating radiator, if you now move the tuning control around you should be able to tune in the stonger MW stations, but they might be a bit quiet. You now need to move the output coil closer to or further away from the tuning coil until you find a maximum point. The maximum point will be quite broad and you might find that if your aerial isn't very long or the station is weak, you find that it is loudest when right up next to the tuning coil. Now you need to do the same with the aerial coil. Move it to and fro on the rod until you find the broad point where the station is strongest. This may also be right up close to the tuning coil. You might need to re-adjust the tuning control while you do this as it can be changed slightly by moving the other coils, but that effect should not be too large. If you have a good aerial and earth then on a strong station you should find that you need to move the output coil at least a couple of inches away from the tuning coil for maximum loudness and you should also find that maximum loudness is achieved with the aerial coupling coil backed away from the tuning coil slightly. If this is not the case, you can add a few more turns to the aerial coupling coil. What have we done with this moving around of the coils for maximum loudness? What we've done here is to optimise the amount of coupling between the three coil circuits in the system to allow maximum power transfer between them for the conditions of your particular components, your particular aerial system, and the frequency and strength of the particular station that you've tuned in. The fact that we have found maximum loudness positions on the rod for aerial and output coils some distance away from the tuning coil, rather than just going for maximum coupling right next to the tuning coil is particularly gratifying. It shows that we've reached an optimum point which can't be improved further by fiddling with the coupling any more. If you have a stronger station you should find that the optimum position for the output coupling coil is further away from the tuning coil. Why is this? That's because the output coil doesn't load the system at all before the diode starts conducting properly, and you need a certain amount of signal before that happens. Things that you'll see that don't work. This crystal radio story wouldn't be complete without me getting a bit tetchy and describing some things that you'll see in the popular literature which either don't work or which are pointless. Let's start with some of the more imaginative output and rectifier circuits that you'll see. Here's an example of a voltage doubler output circuit. The aim of this design is to use two diodes to rectify the positive and the negative cycles of the RF waveform from the output coil and store them across the output smoothing capacitor. In that way, you would supposedly get double the output voltage from a given input voltage across that coil. And if we were dealing with a mains transformer closely coupled to a low impedance input winding with lots of power available, that would be true. It would also be true in our crystal radio if we didn't need to connect our headphones across the output capacitor in order to listen to the output signal. Unfortunately, we do need to listen to that signal, and remember that we've already found the optimum coupling amount by sliding the coil up and down with the single diode circuit. The double diode circuit simply presents a lower impedance load by rectifiying both half cycles of the RF. If you were to use this in the radio you've already made, you'd just end up having to move the output coil further away from the tuning coil to reduce the coupling into this heavier load. This is particularly pointless when you've gone to all the trouble of finding those high impedance headphones. From the point of view of the tuning coil, the voltage doubler has just effectively divided the impedance of your load by a factor of four. So what should you do now? Go out and find some even higher impedance headphones? No. The circuit is pointless. This section could otherwise be called "diode forward resistance, power loss and headphone impedance." There used to be some rash statements in here about successfully using lower impedance headphones without audio matching, just relying on the radio frequency matching between the tuning and output coils. This considered the resistance of the diode which is only about 3 Ohms when it's conducting properly but failed to take into account the power loss across the diode forward voltage Vf. That power is about Vf times the current. Lower impedance headphone means more current, so more power loss in the diode and less in the headphones being turned into sound. So you either need some reasonably high impedance headphones or an audio transformer and I'll be adding more information on that in due course. Signal Strength Versus Output Loading. I've mentioned this already but with a weak signal, the diode isn't conducting very much until the Vf is approached. If it's not conducting it's not loading the system much. You'll find that you need to move the output coil closer to the tuning coil to reach the peak loudness. If your aerial isn't so good, you might find that you need it close up all the time, and the best suggestion there is to try to improve the aerial or earth. I told you that I was going to get a bit tetchy on this subject and here is the circuit diagram of what I'm going to call the "Classic Crappy." 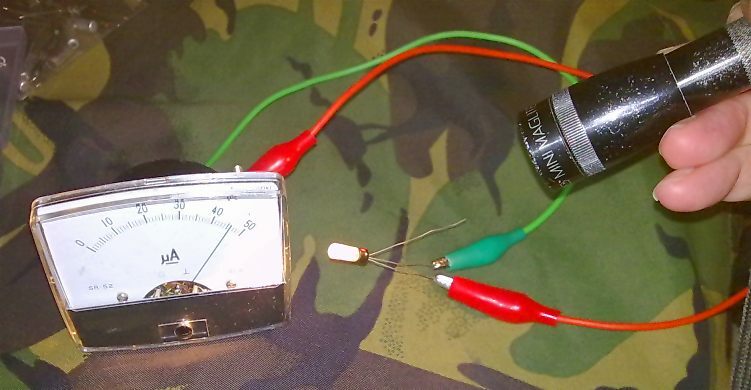 You'll find this touted around in kid's books, some places that should know better like The Open University Crystal Radio, and it is the perrenial favourite in the little educational kits that you can buy. 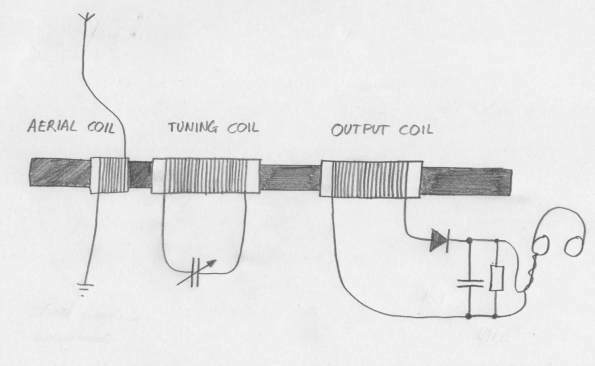 The output you can see is connected directly acoss the top of the tuning coil, as is the aerial. The only thing that I'm willing to admit about this circuit is that it will work, poorly, in some conditions. We've already seen how important it is to get the input and output coupling right, and it's not a small difference that it makes, it's a Big difference, as in perhaps 20dB. That's the difference between loud, and hardly anything at all. What do you do with this circuit if you think it's a bit quiet, such that you have to strain to listen to it or hear nothing at all? Well you put up a better aerial. That brings in a bit more signal, enough to hear something, but now the diode is starting to conduct and then the output loading is far too strong so what should have made a big difference makes a pathetic improvement. It's bad, and it's an example of over-simplification to the point where something deosn't really work at all. So, if you see this design in a text book, hobby book (G.C.Dobbs, I'm looking at You) or on a website, ask yourself if the person displaying it has actually tried it. Crystal radios can be quite fun and give real useful results, not the "straining to listen to one station in a silent room" experience that you might expect. But you need those extra couple of coils or another way to adjust the input and output coupling if you expect proper results, or indeed any results at all. I mentioned that this was my experience as a youngster. I got around the input coupling side of this by connecting the aerial into the top of the tuning coil with another variable capacitor. The reduced loading allowed some actual tuning to occur with my quite capacitive indoor aerial wires and lo, some small signal came out into the crystal earpiece on a couple of stations with a particular favourite (probably leaky) earpiece. But winding another couple of coils was hardly beyond me, if only I'd known what made a difference and what didn't! Another slight digression. These are always the best bits; Right? The crystal earpieces that you can buy used to be made of a bit of fine foil, with the two electrodes joining at an apex on some form of piezo crystal and touching the foil from behind the foil side where you would listen from with the thing stuck in your ear. The modern ones have a piezo element much like the element found in 1980s beeping watches and I've no reason to suspect that they are any less effective; They are probably more consistant nowadays. But if you use a crystal earpiece, you absolutely Have to have a bleed resistor of some 100K Ohms across it as shown in my diagram. Excuse me for putting another nail in the already peppered Crappy coffin, but this isn't a "Nice to have." You may find a crystal earpiece, fundamentally a capacitor which is leaky to a.c. by virtue of delivering sound to the outside world, which is lucky enough to be leaky at d.c. as well. This rare device will work in your crystal radio. But most modern crystal earpieces, and many of the old ones, will just behave like a capacitor and charge up to whatever peak d.c. voltage is generated by the diode and the AM signal tuned in. Again, another "The Crappy" nail. Assuming that you had a non-leaky crystal earpiece that just charged up to peak voltage and stayed there in silence, you might be lucky and get a leaky OC81 diode from an old radiogram. The reverse leakage in the dodgy diode would actually make your previously silent crystal radio burst into life! Maybe those Mullard diodes, hand crafted by Simonstone's or Blackburn's finest ladies in white coats were better in the old days eh? Nope, sorry, it was just a poor design you were building which needed an unusual component with certain poor properties. So, The Actual 80 Metre Good Aerial Experiment. Shown here is my experimental test bed which had two ferrite rods and two dual tuning capacitors. In the event, only one rod and one section of one variable capacitor were used. A lot of the initial playing around that I did with this design was using a very simple AM modulated RF signal generator coupled into the aerial winding with a resistor of around 2K Ohms. Initially I had a double tuned design which used both sections of a 500pF dual gang variable capacitor. Here, the output coil was tuned as well, but this either made setting up the tuning more critical, or in different coupling situations made an insignificant difference. I think that double tuned designs don't really gain you an awful lot, and I'll leave this statement hanging in the air as a challenge to their fans. As we've established, tuning sharpness is dominated in the final analysis by the need to take energy out of the system to listen to the signal. With a decent signal, the output coil is so damped by the output transducer that there's little to be gained by trying to save energy by making it resonant, and if you achieved this, the tuning point also changes as you move the coil up and down to get the best coupling. That turns the process of tuning in a station with best loudness into a multi-parameter procedure, possibly with two separate capacitor controls, and the popular engineering term for that is a "ballache." Finally we get to how well this worked in practice, and what aerial and earth system were used. 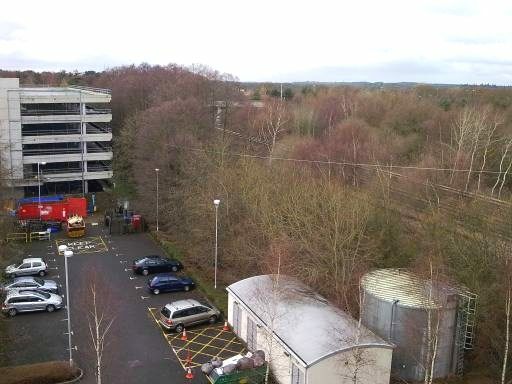 The location was a fairly flat, open area near junction 4A of the M3 in Hampshire, amoung a group of office buildings. I was keen to see just how good a crystal radio could be, having arrived at this design and so decided to go full out for a bit of fun aerial rigging. For convenience I had the radio in my car on a high floor of the multi-storey car park. This car park is covered in a metal lattice structure that was once-upon-a-time intended to be covered in green creeping plants to make it look prettier. This never worked but the structure is well grounded to the reinforced concrete and made a good ground connection. The aerial was about 80 metres of 7 X 0.2 PVC insulated hookup wire. Initially I threw this reel over the side of the car park and unwound it to a point at the ground level of the target building some 80 metres away. A quick check showed some stations coming in pretty well, but the aim was to string the far end up to the top floor of the target building. The building conveniently has a balcony on top, so pulling up the aerial wire with another length of wire and tying it off with a long loop of insulating tape was easy. We have now established an 80 metre long aerial wire some four storeys, perhaps 25 metres off the ground. It's not made of the best wire which would probably be several separated strands of the same thing, like those old "Hoop aerials" that you see on pictures of ships in the 1920s, but it's pretty good and surprisingly heavy and stretchy enough as it is anyway without adding more mass to the system. Is it working? Let's run back to the car park end and see! Yes it is, and working very nicely too. The ideal output coupling coil position is quite dependant on the strength of the station as I expected. The fairly small number of turns on the aerial coil meant that it was very close to the tuning coil for maximum output, but not quite all the way there, showing that I had optimised the input coupling too. I could separate both the main 1215 kHz and the secondary 1260 KHz Guildford transmitters of Absolute radio (terrible name eh? Always begs the question Absolute what...), Talk Sport, and an Asian station down the lower end. Listening volume was very good and you wouldn't want it any louder on the main stations. I thought that I would have a play with using a spare LW coil as an aerial input. As it turned out, when almost fully on the rod this coil and aerial system self resonated at 198 KHz, dominating the MW coil and brought in Radio 4 at a level that was uncomfortable to listen to when adjusted for maximum output. RTE1 and a French LW station could also be heard but as the radio wasn't optimised for this mode it was harder to get rid of Radio 4 to receive these properly. 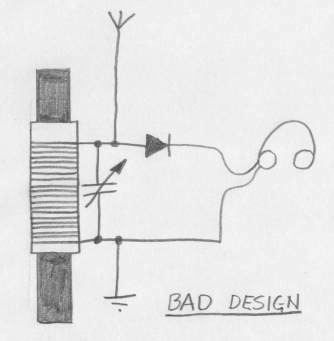 This could easily be corrected by redesigning it for switching in a LW main tuning coil. Ultimately what I would like to try would be to connect a very large, efficient PA horn speaker to the output and make a little self-powered arty listening post on the top of the car park. That way you could come up and sit outside listening to genuinely free radio on your lunch break in the Summer. I had the 16 Ohm Adastra PA driver available for this but hadn't got round to buying the large horn to attach to it yet. So I tried a standard 8 Ohm elliptical speaker with a matching transformer. (Remember the diode resistance?) You could hear the signal with your ear close to it, but this wasn't very useful. Now that I know about how much signal I got in the headphones, I can try this at home with a signal generator. Testing the loudspeaker project properly is one for the next opportunity that I get for stringing up another long wire, which will most likely be next Christmas when the site is nice and quiet again. The crystal earpieces tend not to fit in your ear if you're a kid, can be quite uncomfortable and instantly get covered in earwax regardless of the age of the user. They're not very nice in this respect, especially if you plan to share the earpiece and consequently any ear infections that you might have. If you're worrying about having the diode the wrong way round in the circuit then don't. In a single diode crystal set you can have it either way around and the listening result will be exactly the same. You will just be using the opposite polarity half of the radio waveform to produce the audio signal. When visiting the Thamesmead estate in East London in the summer, it occurred to me while supping an afternoon pint at the Lakeside Bar (dead posh y'kno) that the three tower blocks on the opposite side of the lake would make outrageously good anchor points for a similar experiment, possibly even with two dipole arms meeting at the block in the middle. One of which would go to the ground connection, and the other to the 'aerial'. But don't try this at home, kids. Or at least make sure you're below lightning conductor level. I've completely neglected the reactive properties of the aerial which could be tuned out, or perhaps more accurately stated tuned in with more controls. But that would be frequency dependant and we've already been down the two tuning controls route and decided that's a bit of a fag. Some old germanium transistors have a transparent filling underneath the black painted glass encapsulation. These will actually generate 100uA of photocurrent when under a lamp or certainly in sunlight. I once met a circuit in an old library book from the 1960s which used just such an item in a Hartley oscillator using a small audio output transformer. It would oscillate audibly with No Power Applied into a crystal earpiece when you shone a light onto it. I was impressed by this piece of cleverness. So maybe you could even use an old OC45 as the demodulating diode and get some gain out of such a crystal set when there is light available. You could argue that this is cheating by using an external power source, but if a candle or the sun will work I think we're still qualifying. I've tried an initial experiment as shown in the picture below where you can see 45uA coming out of just such a scraped-off OC45. The current is measured between emitter and base and also occurs between base and collector. The current is very dependant on finding the exact sweet spot with the torch. It can go much higher than 50uA and I'm sure in sunlight it would be higher still. I tried using a transistor like this, with the base and collector shorted, as a demodulator. The Vf was very low, about 200mV and was louder than the best OA81that I've found so far. It was leakier in the reverse direction though. Shining a light onto it made no magic difference, with strong or weak input signals, so more fiddling with this is a project for the back burner. If anyone has tried and suffered "The Crappy" crystal radio set design before, I hope this page offers some light. Those people in the 1920s weren't so daft and they weren't necessarily straining to listen to their crystal radio.